I am wishing you all a wonderful Friday. Finally the problems with the search engine is solved. It had been a hell of a ride recently, which also prevented me from writing posts. I am hoping to make it up for it although until the exams week in the beginning to July, I might be slow. Thanks so much to those who are still hanging there. Big hugs for the commenters too, these make my day although I can rarely answer. I will try to get to that soon. 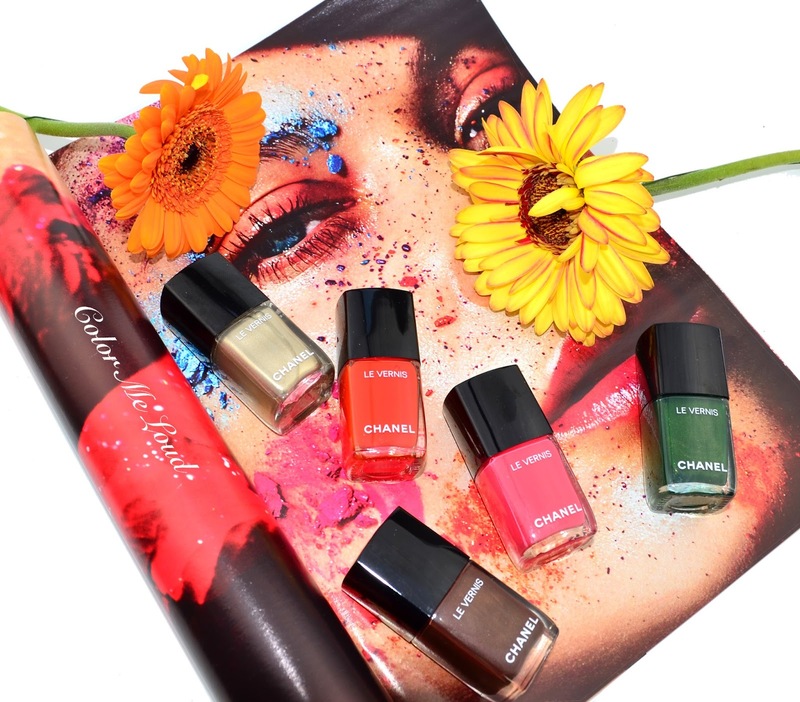 Chanel's Summer Collection Dans La Lumière L'Été is recently released in Germany. Each year I fell out of love with Les Beiges powders so this year I decided to skip these. I went for the eye shadow palette which I will also show you soon and of course for the nail polishes. There are five new nail polishes in their new Long Lasting formula. These are not listed as limited edition so I am guessing that they will extend the Long Lasting Le Vernis Collection. It is still not clear of the regular Le Vernis is discontinued. 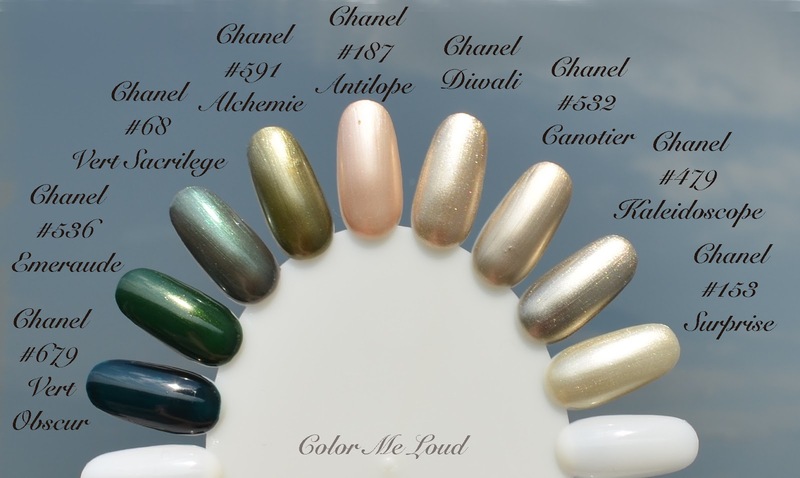 Here are the swatches, thoughts and comparisons of Chanel Le Vernis Long Wear Nail Color in #532 Canter, #524 Turban, #534 Espadrilles, #536 Emeraude and #526 Cavaliere. I would like to start with my least favorite among five, #532 Canotier is a pale cool gold with a slight green hue to it. The finish is metallic and it leaves visible brush strokes. It is opaque in two coats which I am wearing in the swatches below. Canotier is a looser for me not only because of the brush strokes but also the lack of complexity even under direct sun light. It doesn't have the wonderful finish of others golds I have from Chanel such as Diwali or Kaleidoscope. Now onto my favorite from the five, something Chanel has never done, a real emerald color, #536 Émeraude! 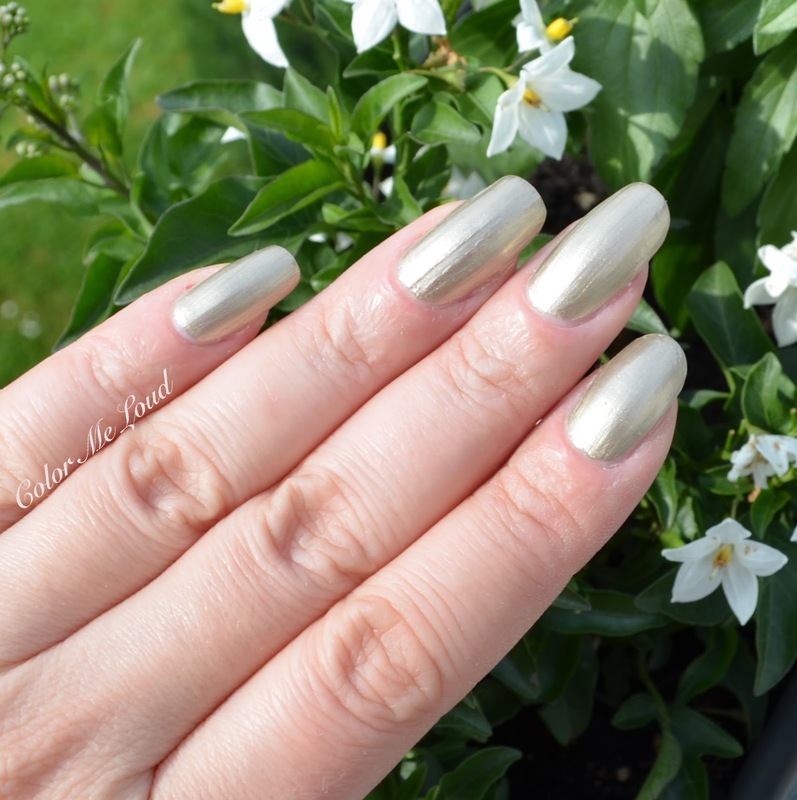 This one is so beautiful with golden shimmer which is visible in the bottle and becomes visible on the nails only when under direct light. I am wearing it since two days and I don't even have tip wear although I have been constantly typing. Last week I wore Chanel Sweet Star because I love the shade so much but it chipped within 24 hours. As much as I think the new formula has to yet prove itself in terms of complexity, I am definitely sold for it because I don't have to reapply the other day. Émeraude is a true gem, not too blackened and very flattering on me, loving it to bits. I also got some compliments wearing it. That said, I don't think it is necessarily a summer shade, but I couldn't care more. Below I am wearing two coats although it is opaque enough with only one coat too. Here are some comparison swatches for Canotier and Émeraude. 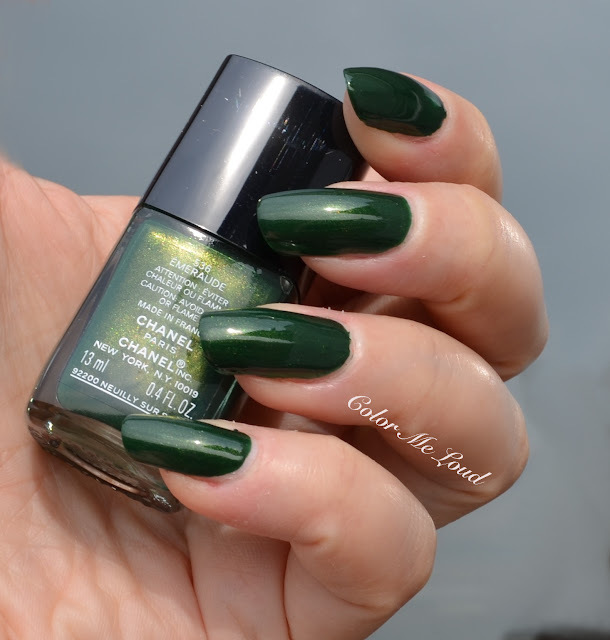 Chanel Le Vernis #679 Vert Obscur (reviewed here) is deeper and more blackened than #536 Émeraude. It is also cooler in terms of green tone. Chanel #68 Vert Sacrilege is cooler with more blue tingle. It is also more duo chrome and more metallic. 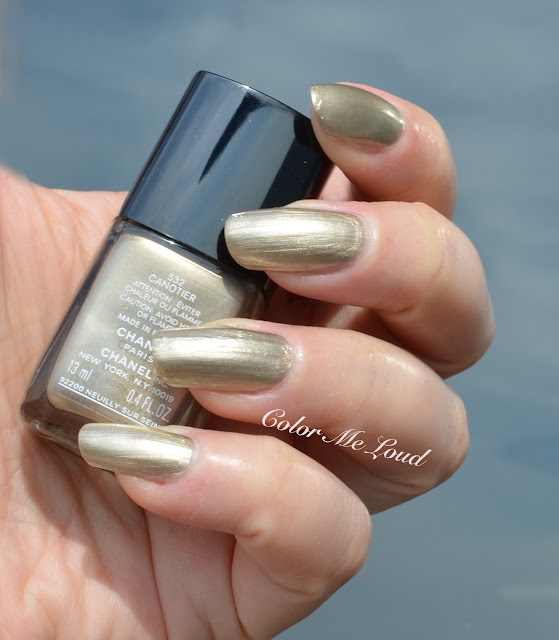 Chanel #591 Alchemie is warmer with more golden undertones. I still don't know why I included #187 Antilope but it must have looked like it is close in the bottle. #532 Canotier is close to Chanel Diwali in terms of shade but Diwali is more complex with less brush strokes, less metallic and more with a foil finish. #479 Kaleidoscope has more green tingle, it is also more complex with less brush strokes. Chanel #153 Surprise is a bad surprise really, sheer and very streaky. It is lighter than Canotier. 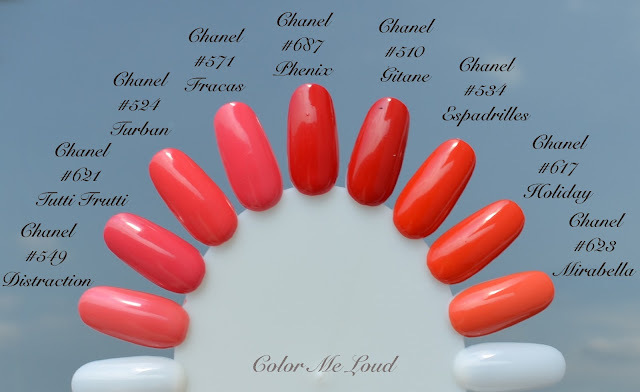 On the reds and pinks category there are two polishes from Chanel for this summer. Chanel #524 Turban is a lovely mid-toned coral which is more vibrant than some other shades from the brand. For a reason I always associate Chanel with low-key shades with less white and which look less florescent than Dior's. Turban is not as vibrant as some Dior shades but definitely brighter than other Chanels in my collection. I really like it. It has a cream finish and is opaque in two coats. I am wearing two coats in the photos below. Just a side note, the consistency is slightly on he thicker side so you have to apply carefully. 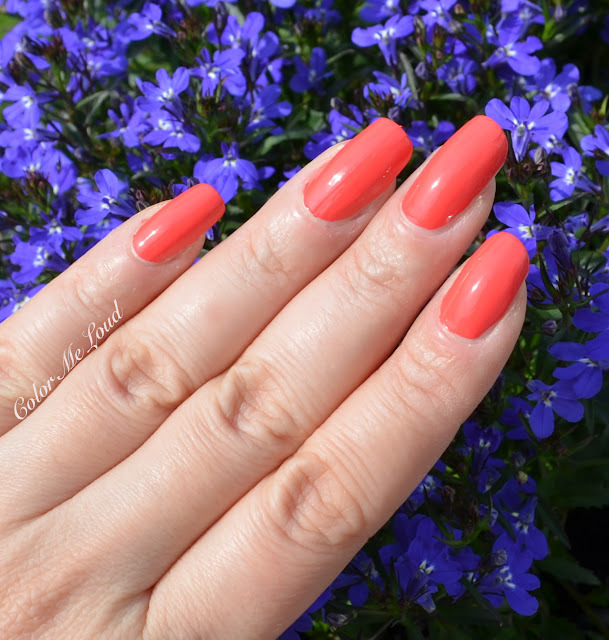 An of course we can't let a summer go by without a really vibrant orange nail polish. 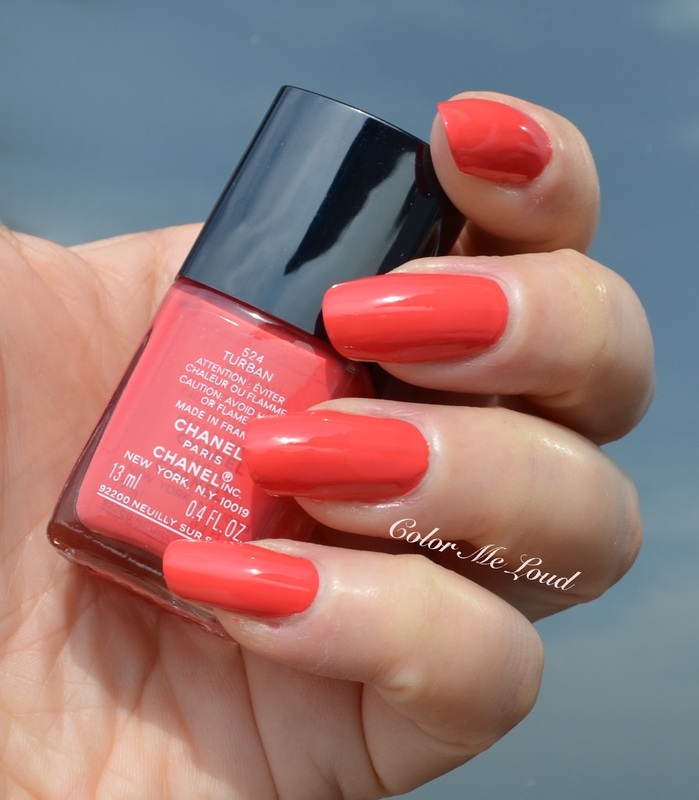 Chanel Le Vernis #534 Espadrilles has slightly jelly consistency and applies wonderfully. It is opaque in two coats. If you have imperfections on your nail surface, you may want to use a filling base coat with this one though since it may show it. One of my favorites of this collection although it is very close to a previous release, Chanel #617 Holiday. Chanel #524 Turban is brighter than #549 Distraction and warmer and brighter than #621 Tutti Frutti (reviewed here) and warmer than #571 Fracas. Chanel #687 Phenix (reviewed here) and #510 Gitane (reviewed here) are both more red compared to Chanel #534 Espadrilles. #617 Holiday is very close to Espadrilles, just slightly warmer. If you already have Holiday, I don't think you need Espadrilles though, they are almost dupes. Chanel #623 Mirabella (reviewed here) is cooler and not as bright. 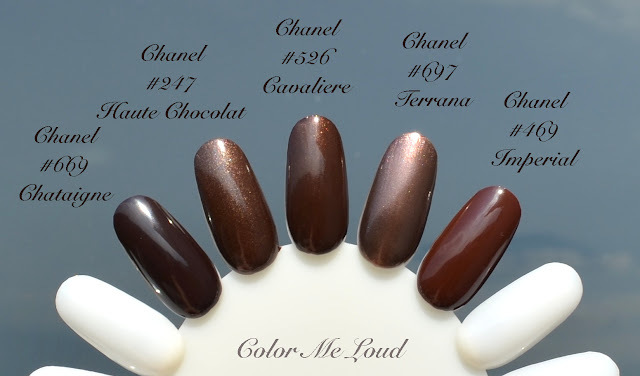 The last shade got me really excited when I first saw it because it reminded me of Chanel #247 Haute Chocolat which started to be very hard to get even at evil bay. It is one of my all time favorites from Chanel so I was glad to see something close to it. 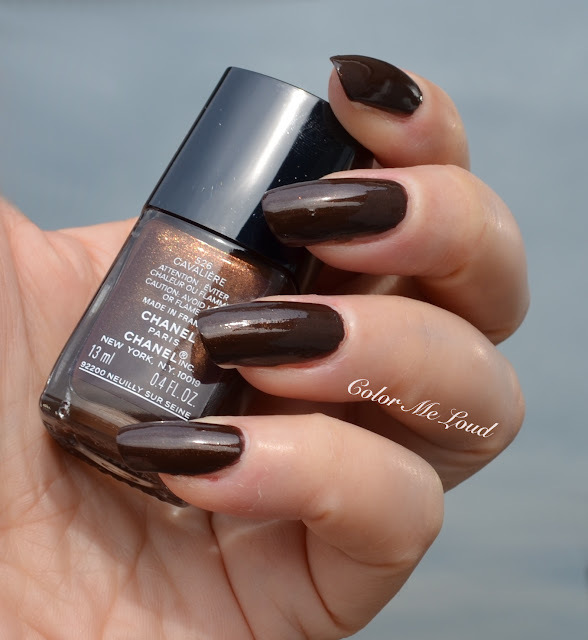 Chanel #526 Cavaliere is a neutral brown shade with golden shimmer. 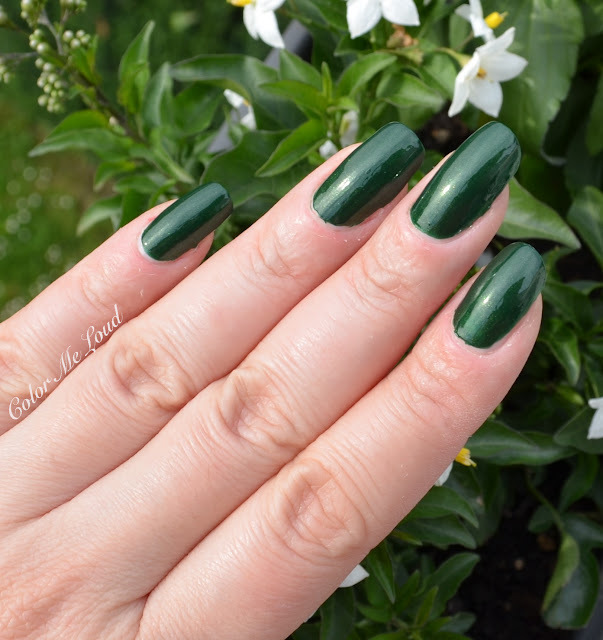 The finish is close to Emeraude, the shimmer is more apparent in the bottle than on the nails but it provides a nice complex look to it. Again, not a summer shade for me but I really like it. Below you can see it with two coats. Chanel #526 Cavaliere is a lovely shade but unfortunately it is not as complex as Haute Chocolat on the nails. #247 Haute Chocolat has more shimmer particles which are more visible even in shadow. Chanel #697 Terrana is more plum and metallic. Chanel #497 Imperial is warmer and doesn't have shimmer. Chanel #669 Chataigne is deeper and straight cream without shimmer. Final thoughts: All in all I am still impressed with the longevity of Chanel's new formula but some of the shades lack complexity and some are a little thick in consistency. Miss of the collection is #532 Canotier because of visible brush strokes and lacking complexity. My favorites are #536 Émeraude and Chanel #526 Cavaliere. Are you eyeing any of these polishes for the long awaited Summer days to come? Thank you for swatching all the shades, I was very excited to see them worn! Cavalière is my favorite, but I agree that it's not really a summer shade. I think OPI has a dupe of Canotier in their New Orleans collection: Take A Right On Bourbon. I got it in a mini set and on me it looks exactly like Canotier in your swatches, but a little more forgiving (not showing brush strokes as much, although it still does). Diwali and Kaleidoscope are long time favorites. And I even like Sunrise, truth to tell. But Canotier does seem blah. Emeraude is the real beauty here. I was amazed as how its depth makes Vert Sacrilege look pale, and Alchimie looks gold. Love to see these comparisons. I am tempted by Emeraude although I feel perennial guilt over not ever wearing Alchimie. Maybe this fall. Your nails look exceptional this time of year. And the comp made me rethink my returning Terrana. My vote goes to Emeraude. Sorry I meant to say Surprise. But I am probably one of the few who looks good in a pale lemon gold. Anyhow, good to have the blog back and two posts in one weekend. I swatched Emeraude at the counter and it is really beautiful. LOVE Emeraude too!! It's easily my favourite Chanel polish of all time because it's a 1-coater for me, and it lasts. I think your swatches are beautiful, Sara, and i'm glad you're back at last! Will be catching up soon! Surprise is very sheer, not recommended. I paid so much for it through e-bay and the only surprise I got was a bad one haha. Cavalière is beautiful! I love it too! Oh Susan, you shouldn't have missed Haute Chocolat, that one is so exceptional. We were discussing with you about Emeraude having the old or the new formula so I would like to write you and let you know that it is labeled as Long Lasting. I know you don't have the same experience but these last on my so long. I applied Emeraude on Thursday, I don't even have tip wear until now. Knock on wood. yes with one coat it is also more green but out of habit I always apply two. I am trying to be back although until mid July I will be on and off. After I have prepared the exams, I can breath. I think this year I deserved the summer holiday more than any other year. I can't wait. Oh, please don't. Your nails are great. I did gel nails very early on for about six months and I am lucky my nails recovered. Very damaging-- too much solvent use on removal. When you have great nails to begin with-- not even to be considered. What you should do is block the people who make nasty comments. People are going nuts in the world and when they start in like that with me, they are gone in a flash. You have gorgeous, long nails. I am somewhat jealous as mine crack and peel, so they need to be kept short. From this collection I like Turban. Diwali is still my favorite gold from Chanel. Emeraude und Cavaliere sind meine zwei Favoriten. Vor allem Cavaliere ist einwunderschöner Schokoton. I love Emeraude. It's something I probably won't pick up myself, but I love how it looks on you. And your nails. So long! I don't think I've had mine that long before. I can't take the sound when it scratches my keyboard. HAHAHAHA! Sara, your natural nails are lovely! Never mind the haters on Insta. Nails will always go through trends, just like eyebrows! Soon the instagram eyebrow and the gel nail will be a trend we can look back on and wonder why(like thin penciled '90s brows, or super square acrylic french'80s manis). We always come back to more natural. I always appreciate your swatch and compare posts, so thanks so much for this one! This is true. Tastes of all sorts change. And I wish I'd thought of that when I got all those frigging holo polishes a few years back. Now I am more into creams. But the new trend in colored eyebrows is fun. Just applied Cavaliere but it is so thick, I found it really tough to get two coats on but one didn't cover. I have 'given in' and bought the top coat so we'll see if I finally get the longer last most people have found! It's Wednesday afternoon and I'm hoping to get to Saturday and my professional manicure without chipping! Not a big fan of Canotier and Espadrilles but the other ones are so pretty, I own Cavaliere, Turban and Emeraude which I got for my birthday - Can't wait to swatch it. I find this summer collection pretty cool !